American government today is about lies, lies, and more dirty lies. Thank goodness for Jesse Ventura—the ultimate non-partisan truth-seeker. He has no qualms about questioning authority, and does so in style with this deck of cards that takes readers through the secrets and lies that former Governor Ventura reveals. American Conspiracies: The Card Set offers an informative approach to the cover-ups on JFK’s assassination, Watergate, stolen elections, economic bailout, and the realities of martial law in the U.S. This conveniently-sized guide emphasizes the importance of knowing what’s really going on in our country and uncovering dirty scandals that our government wishes us not to know about. You will not only be aware for what our past holds, but you’ll have the information on-hand with clever notes by the former Governor himself. 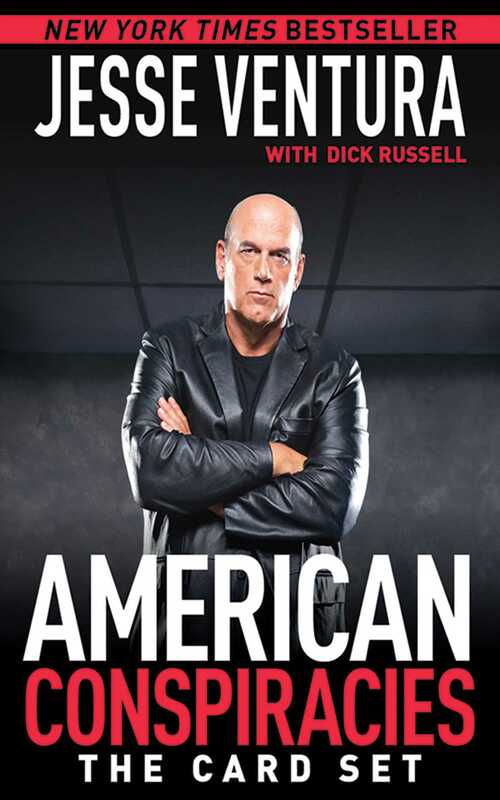 Jesse Ventura is known throughout the world as a truth-seeker, one who will not accept what’s told to him when he knows that the real answer is just around the corner. With this handy card set, you will be able to carry around all the secrets that Ventura wants you to know that your own government wishes you had no idea about. Get ready to be shocked and awed at the real information of our counties past told the only way the former Governor can…with an in-your-face attitude and the knowledge and wisdom to back it up!